These testimonials are a few of those collected by the Institute of Professional Will Writers - they were chosen as the most recent at the time the web site was updated. The Institute only accepts testimonials that have not been influenced by County Wills, and if you go to the IPW website you can see the full range of testimonials accredited to County Wills. Do you want the security of knowing your estate will be taken care of after your death? Writing a Will is an important part of your long-term planning. By making a Will now, you can get on and enjoy life instead of worrying about the future. Without a Will, you have no control over what happens to your estate after your death. For your peace of mind, County Wills takes care of everything for you. 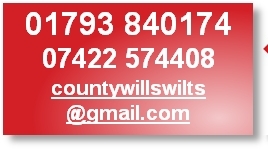 Based near Swindon, County Wills provides a personal Will writing service across Wiltshire and the South West. For more information, call Ann Douglas on 01793 840174 (or 07422 574408 if you prefer). Alternatively, email your enquiry and she'll get back to you. If you die intestate: without a Will, everything you have worked for will be at the mercy of the courts. By making a Will today, you can make the decisions about who will benefit from your estate. Making a Will is particularly important today with the all-too-frequent marriage break-ups, remarriages and civil partnerships, and the resulting extended families. Many people choose to live together rather than get married. In this situation, it is essential to make provision for your partner in your will. Making a Will is not just for people with children or step-children. If you have no legally accepted next of kin, the courts could pass your estate to the Crown if you don't make your wishes clear in a legally binding Will. Because you've worked hard all your life you are entitled to ensure the people who mean the most to you are provided for. Should you die without making a Will (intestate), the law decides how your estate is divided. This sometimes means loved ones aren't beneficiaries, causing untold stress and heartache at an already traumatic time. With Ann's expertise, you can safeguard the future, eliminate any argument, and avoid the strain of hefty solicitor's fees on your estate. Life is never simple. To guide you through the options available, Ann visits your home at a time convenient to you. Using plain, straightforward language, she'll guide you through the process of making your Will. Ann will explain everything you need to know, highlight any possible difficulties and answer all your questions. Throughout life, we encounter milestones which change our situation. This might be the birth of a child, divorce, or even when someone has been really important to your life and you feel that they should rewarded by a mention in your Will. It is critical your Will is updated if your personal circumstances change. In the case of divorce, your estranged husband, wife, or civil partner could still benefit from your estate should you die before your divorce is finalised. If your Will is out-of-date, contact County Wills for advice by email or by phone on 01793 840174 (or 07422 574408 if you prefer). A Lasting Power of Attorney protects you in life if you become incapable of managing your own affairs. This is an optional legal document which allows you to appoint someone to act on your behalf should you lose capacity. Though you may have all your faculties intact now, the day might come when you are unable to make choices. A Lasting Power of Attorney can only be made by someone of sound mind, so it is important to address this before it's too late. It is only implemented if or when you are unable to make decisions for yourself. Many people choose to make a Lasting Power of Attorney at the same time as they make their Will. County Wills can put your mind at rest by arranging this for you. For further advice, contact County Wills, Swindon's Will writing specialists on 01793 840174 (or 07422 574408 if you prefer).